I love the Cyprus shops because they sell stuff I cannot buy at home, things such as lace, leather, silver, copper and certain foodstuffs. You will of course find the usual tat Cyprus shops selling plastic from China, but any self respecting visitor will know what not to buy,and you will find plenty of quality items for purchase. Souvenirs and supplies are available everywhere from lots of Cyprus shops. Small and petite boutique shops, street stalls and larger more well know shops are found in all the large towns and if you go into the villages and up to the mountains, basic foodstuffs can be found as well as in little stalls along the roadside. Hotels will often have their own shop and it will be expensive to buy from but you may pick up something exclusive in one of the more expensive ones. 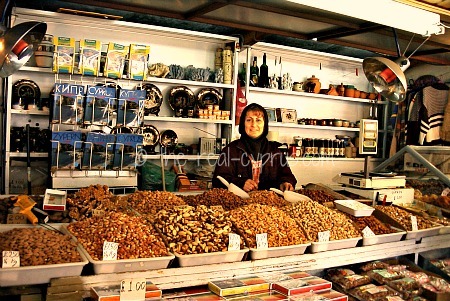 The island is awash with local honey and handpicked olives so you can find them everywhere and at a reasonable price. 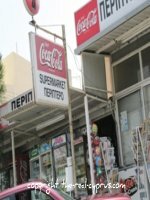 If you want food and drink there are plenty of supermarkets, chains in the larger city areas are run like any other international supermarket and smaller mom and pop shops are found on every street corner. In summertime, the cyprus shops open early, close for a siesta in the afternoon about 1pm till 4pm and then open again for shopping until later in the evening. Some shops close on a Wednesday, the banks have different hours in summer to winter so worth checking before you find yourself outside a locked building! One of the nicer things about being abroad I find, life works with the weather, rather than you having to struggle with the weather to go about your daily life. Some of the larger shops such as Debenhams are even open on a Sunday now which was unheard of until recently. In winter time, the reverse is true, shops close earlier, some may not have their siesta time and so on. It is completely impossible to give you a definition about timings you will have to just find out when you get there and need to go shopping. People will be more than helpful in advising you. Credit card use is widespread in larger shops and restaurants but on the beach, in the market and in smaller shops cash would be adviseable, just in case. Cash is king and there are more than enough banks to allow you to get cash easily. Limassol market has had a huge facelift over the last few years, lots of EU money spent on bringing it up to health and safety standards, which was great since it had become somewhat decrepit and and unhygenic over the years. You can buy fish and meat, fresh herbs and a variety of nuts and seeds and plenty of pulses too in great big sacks. Just the ticket for making those local dishes you love. Naturally the markets start very early in the morning until around lunch time. If you get chance to go, do try because they crystallize the island character, the sounds and smells, the bustling and a slice of daily life on the island. It would be my choice to visit there to take some really authentic cyprus pictures if you are keen on photography Local life at its best and most authentic. You never know you might go for a coffee and end up coming home with a chicken! Take your phrasebook..lol!. If you want to take some food home as a treat then here are some suggestions. Jars of the glyko the local sweetened, glace type of fruit, are available in lots of varieties, my favourites are quince, walnuts and those little baby aubergines and if you can get some from a local village you will have something truly authentic, particularly if it comes out of someones pantry. For ease though, you can by it in jars in the supermarket, Katerina Sweets is the most well known brand, and you can visit the small factory in Doros Village in the Limassol Area. Local honey, some have walnuts in for added authenticity with your greek yoghurt is something special. 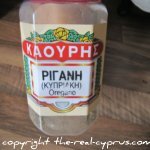 It tastes nothing like the commercially created honey you would find on your local supermarket shelf and tastes wonderful on hot buttered toast, especially made from the local village bread. 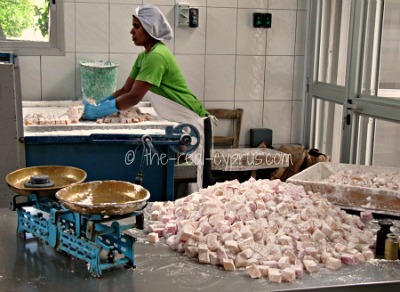 Cyprus delight loukoumia is the cypriot version of Turkish Delight and very special to Cyprus. You must go to the shop in Yeriskipou Village on the east side of Paphos to see it being made, in a very simple way, by the lady in the photograph above and choose what flavour you like. Nothing quite like it, freshly made, sweet and delicious. It is amazing what you can do with sugar, water and a bit of cornstarch really, isn't it? Our favourite is OUZO flavour, which is suprising as neither of us like or drink ouzo. Every flavour under the sun is available, and you can get mixed boxes of several flavours and you can usually try before you buy. On the savoury front, we love to take home the local herbs such as rigani (greek oregano). If you want that authentic smell in your kitchen with your roast lamb and potatoes, you should invest in a large tub of the stuff. It is not expensive and the tubs are huge compared to the pathetic little jars of herbs/spices we get in England. Just add a lemon to the pan and the smell will transport back to that special little taverna on the beach, even if it is a rainy afternoon in Rotherham. Recommend Any Drinks To Take Home? The cyprus shops have quite a few specialities worth taking home and they are usually of the liquer variety, but they are nice, not something you might take home for your mother in law and she won't want to use it and it ends up quietly going into the bin, or worse, some distant relative gets it for a christmas present. 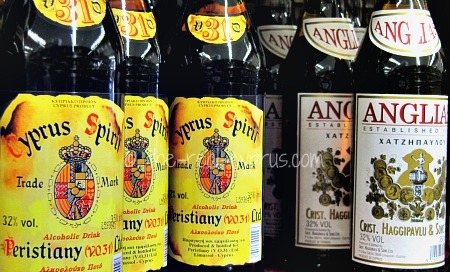 Brandy is a well loved item on the island, the cypriots love their brandy either neat, or with coke or lemonade. Our personal favourite is the brand called Anglias which is great for chucking into a glass with ice cold coke,ice cubes and a slice of juicy Cyprus lemon, but if you want something like the Greek Metaxa Brand quality, you should be looking at the brand called5 Kings. It is absolutely best just drunk on its own, no ice, nothing, just perhaps a cigar and coffee if you like that sort of a thing. We really love the orange liquer called FILFAR, sometimes you get it at the end of the meal as a freebie, but it is very good quality stuff. Worth a mention if you like a different kind of drink. You can now buy it in an lemon flavour but I like to stick to the orange one. I have a preference for the Italian Limoncello drink instead if I want a lemon flavour. 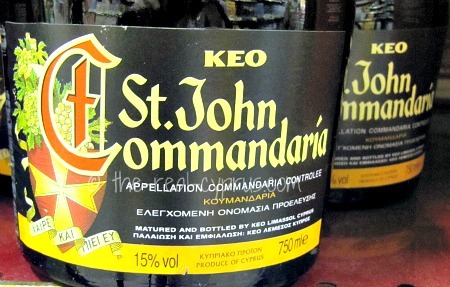 Commanderia is another very cypriot drink, a fortified wine, a bit like a cross between a port and a good sherry, used a lot in the church, so you cannot get a better thumbs up than that. In July each year, a Commandaria Festival takes place across the Commandaria wine region, on the south western slopes of the Troodos mountains, but in the Limassol District. You can sample the wine and join in the celebrations with the villagers for another happy harvest. 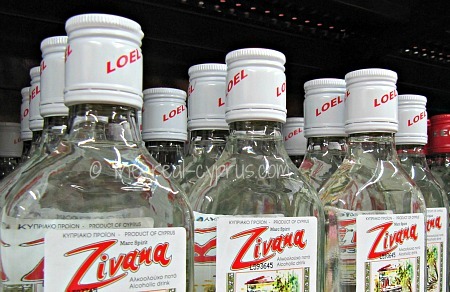 Zivania (pronounced zoovaneer) is the local hooch or firewater, it used to be made a lot at home by families, you might find someone with a still in the mountains, but now it is much more commercially produced by the wineries. It you get the real stuff at someones home, it just may blow your socks off! Wine is widely available at any of the cyprus shops mentioned and if you find one you like, you may even find them on your own countries supermarket shelves now. Ouzo you could of course buy ouzo but it is not really authentic cypriot, it is imported from Greece or made under licence from Greece, but if you like it, hey.. why not! Again like other spirits there are good ones and bad ones. 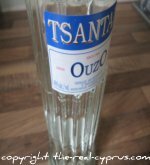 You can buy really fantastic quality ouzo in specialist shops and they can advise you about the ins and outs of what makes the best quality. You can also just pick up a bog standard bottle from the local supermarket and enjoy it just as much. Personally I wouldn't have a clue. Now visiting the cyprus shops can get interesting. 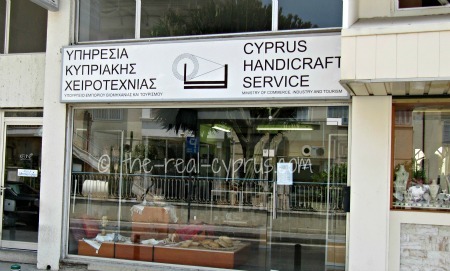 The Cyprus Handicraft Service has a shop and some workshops in the major towns and cities, so if you want truly authentic, with a handmade in Cyprus, label on your souvenir, then visit these shops for some wonderful wickerwork, pottery and traditional crafts. You cannot go wrong with this choice, they are though, quite pricey so something to bear in mind. If you want to buy authentic lace, the village of Lefkara in the Larnaca district is the place to go, or in other cyprus shops in the village of Omodhos in the Limassol district. Its a lovely village, you will be a bit pestered to go here, there and everywhere to buy but if you buy authentic lace, it is worth it. The lace is very expensive, especially the larger pieces but you are getting a beautiful item. You can buy cheaper stuff in the main towns and my particular favourites are the christmas tablecloths you can buy, and the white cotton ones. I have bought many over the years for people as gifts. A white lace tablecloth makes for a very special table setting I always feel. My mum bought a red and green christmas one about 15 years ago and it still looks like new! Tin, Copperware & Silver are much in evidence & textiles. I think everyone will find something for their budget. There are some nice art pieces, iconography if that is your thing and contemporary ceramics as well if you want something a bit different, and if you just want cheap and cheerful there are the common type of mugs and t-shirts as well in the cyprus shops. You being the smart and savvy shopper that you are will soon pick our your favourite things, as soon as you hit the street. My top tip though is to buy early on in your trip so that you don't spend your souvenir budget on something else... like enjoying yourself...lol! 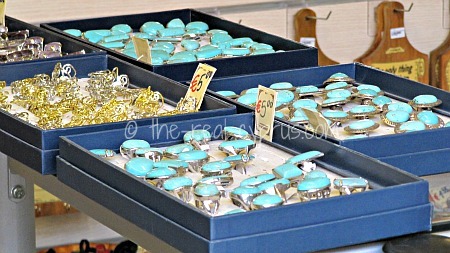 My favourite is the Jewelery in Cyprus, you can get beautifully made nearly pure silver items and the gold is at least 18 carat if not 22 carat much of the time for the price of what you would pay at home and you can get pieces made for you if you have the time, and some of the gem stones are gorgeous. Another great buy is shoes and handbags, often imported from Italy but the range is vast and you will definately find something you won't see at home. Another top buy from the cyprus shops is eye glasses. Pretty cheap certainly compared to UK prices and you often end up with a designer pair for less than you might expect, but that said I don't think the sunglasses are particularly cheap. You might be better of picking up a pair in Duty Free or in your own local optician or eye specialist shop in your home country. Mike, my husband always buys his regular glasses though when he visits. 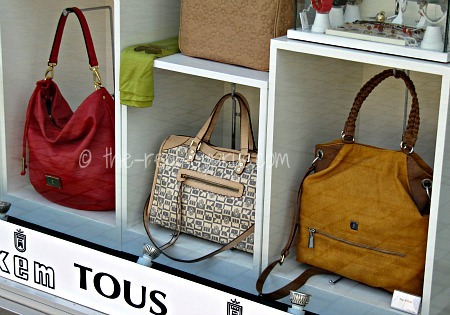 So plenty of choice and plenty to do when you hit those Cyprus shops.